Writing a review of a great game is easy, when a game is exciting and fun to play your enthusiasm is on tap and the words flow. Writing a review for a terrible game is likewise just as easy and the more you hate a game the more you can channel the bile. The problem comes when reviewing one of those middle of the road games, just how do you get over to someone that a game is just okay? Daredevils & Co. is one such game, it’s not terrible but it does have some annoying features. It’s not good either but with some better written rules and a bit more playtesting it could be a good game, it could even be a great game. In Daredevils & Co you are fighting for control of a number of fortresses in a world of Victorian steam punk and high fantasy, think of Terry Pratchett’s discworld and you’re not far off the mark. Players are split into one of two sides; bright and dark, however this isn’t a team game, no it’s every goblin and elf for themselves. To claim these fortresses you have to make sure your collection of troops is the strongest leading the attack. You do this by placing cards against fortresses; the clever thing in Daredevils & Co is that you don’t have access to all of your troops. 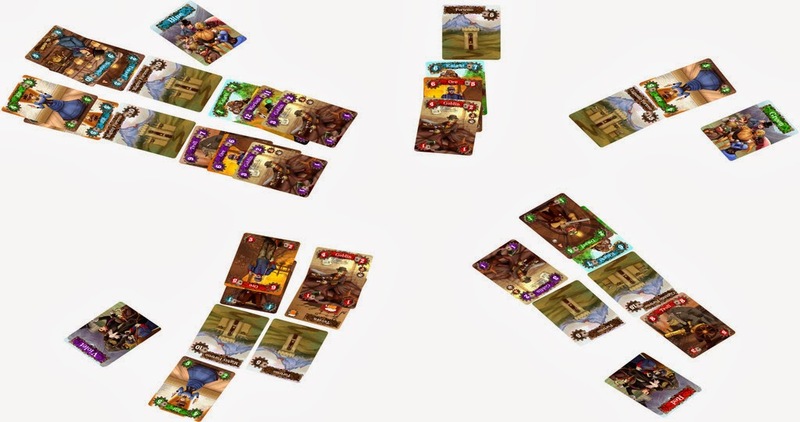 All the players’ troops are combined and you only get to choose one card at a time out of the deck to put into your hand, you then have to pass that deck on to the neighbouring player. This means that not only do you get the opportunity to choose where your troops are attacking but you also get the chance to choose where your opponents get to attack. It’s a rather neat feature of the game and creates an interesting choice; do you grab your own soldiers from the deck or do you deny your opponent access to their best troops? There’s also a selection of power ups and instant effect cards available such as assassins and landmines, just to mix things up a bit. After the first round players must defend the fortresses they've won. Once all the decks are depleted it’s time to determine who has claimed which fortress and so a complicated set of maths starts. Before the fortress can be stormed the forces of bright and dark scrap outside the fortress for a bit, eliminating the weaker side. Then if the combined strength of the winning side beats the defence of the fortress, the fortress is stormed. The player with the greatest combined strength of the winning side takes control of the fortress gaining them the victory points. Again it’s another neat little design choice; it makes the location of any card of importance because even though your card may not be able to claim the fortress for you it means every card can affect the outcome of the siege, gaining every player the ability to influence the result. From the second round onwards things works a bit differently. Since players now own fortresses they now can defend them against attack, by placing cards on their side of the fortress. You can also play cards from opposing factions as defenders (or even attackers) but when you do the card is flipped, revealing a lower attack and defence score. There is the risk though that if you play another faction’s cards and the faction’s owner places one of their cards in the same match up then the card switches sides taking the score away from you and giving it to your opponent. The cards are rather good looking but some of the symbols could be clearer. The problem is this second turn is so different to the first it makes you question the point of the whole first turn. It doesn’t help that several of the action cards don’t really have an effect during the first turn. Why have a turn that works so differently to the rest of the game? Why not just split the fortresses between players so the rules are the same throughout? It makes Daredevils & Co awkward to learn and to teach. Daredevils & Co has some great concepts, the card drafting works brilliantly and there’s a quite a lot of strategy in choosing where to place the cards but the rest of the game is marred by a difficult to understand rulebook, some ambiguous instant effect cards and a split personality. Most of the problems stem from a rulebook that appears to have been written by a non-English speaker; a better written set of rules and effect card explanations will go a long way to make Daredevils & Co and a more playable game. There is the seed of a good game here; it just feels like the game needs a little more work. The basic principles function but you can’t help feel that with a little more effort it could be a good game, at the moment Daredevils & Co is a bit of a mess. For starters the rules need a good re-writing but mostly the game has to decide whether the rules for the first round or second round are the way it wants to go. There aren’t even rules for a standard game length; the rules simply leave the number of rounds up to the players and don’t specify any end game conditions. All of this suggests that the game hasn’t been play tested enough and that’s a shame, because the fundamentals of Daredevils & Co, and the cards themselves, are great all, the game needs is a rulebook update and then it will be worth a second look. Daredevils & Co is available through Gamecrafter.